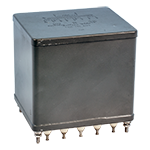 Power Transformer 108/117/125V AC to 5V @ 2 Amp, 6V @ 1.5A, 6.3V @ 3.5A, 30V @ 1.2A, and 260V c.t. Utah plate and filament transformer. Electrostatically shielded. NSN:5950-00-647-7212. ETC plate and filament power transformer. Hermetically sealed. Mounting centers: 2" x 2.5". Circa 1983. 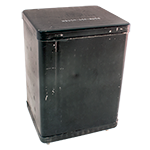 This fine specimen of a hermetically sealed plate/filament combo will look superb atop your home-brew chassis. New in the box. NSN: 5950-00-645-6762. 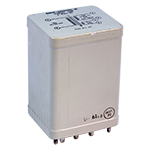 Peter Dahl for Hallicrafters HT32 & HT37 power transformer. Primary: 117v, 60 Hz AC with multiple secondaries 880 - 270 - 140 - 0 - 270 - 880v AC @ 330 milliamps, 6.3v @ 11 amps, and two 5v @ 3 amps each. Dimensions: 4.25" x 5.25" x 4.375". Peter Dahl Galaxy V power transformer. Primary: 117v AC to multiple secondaries 12.6v @ 6 amps, 24v center tapped @ 500 mA, 80v AC @ 50 mA, 285v @ 175 mA, 860v @ 250 mA. 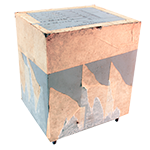 Dimensions: 4.375" x 5.25" x 4.2"H. Weighs 14 lbs. 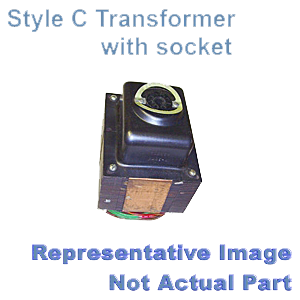 Power transformer. 50 - 1000 Hz. Unknown currents, 300 watt core. Primary: 115v (Black / Yellow Black) to multiple secondaries; (Orange HV Wire) 7.5V, (Orange / Orange) 7.5V, (Gray / Gray) 7.5V, (Green/Green) 50V c.t. (Green-Yellow) 25V, Yellow-Gray / Yellow-Orange, (Yellow-Gray / Yellow-Orange) 83V, (Brown / Yellow-Brown) 125V, (White / Orange-Brown) 125V, (Yellow / Black-White) 165V. Isolation Shield (Blue). Made in 1963. NSN: 5950-00-984-1188. Power transformer. Open frame, horizontal terminals / studs on the bottom. Made in 1965. NSN: 5950-00-519-8792. Federal Telephone & Radio (FTR) power transformer. Sealed. Shielded cores. Brand new in the box!! Manson Laboratories filament transformer. Hermetically sealed, electrostatically shielded. 6.1v, 5.6 amp filament winding. 75v DC @ 30 ma in a HW bridge / capacitor input configuration. Used, removed, excellent condition. 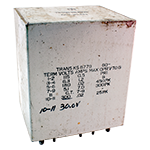 Tranex open frame transformer. NSN: 5950-00-403-4131. Very nice. Federal Telephone & Radio (FTR) power transformer. Sealed. 890wv. Shielded cores. 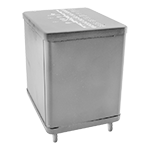 Primary: 115v AC 50-65 Hz to two secondaries, 258v RMS - 0 - 258v RMS @ 110mA or 516v, and a 5v @ 2A. Dimensions: 3" x 3-1/2" x 3-3/4"H. New in the box!! Transformer. Hermetically sealed. Primary: 115v AC 60- 400 Hz to five secondaries: 6.3v @ 1.5 amp, 6.3v @ 3 amp, 6.3v @ 3 amp, 6.3v @ 4 amp, and one 375v @ 90 ma. 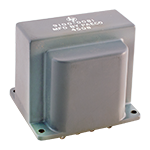 Dimensions: 4-1/4" x 4-3/4" x 5-1/2"H.
UTC plate & filament transformer. Hermetically sealed. Rounded corners. New in the box!! 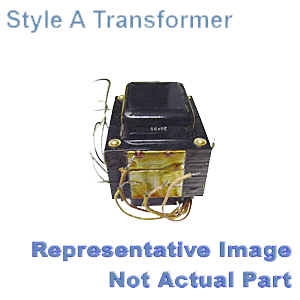 Stanley power transformer. Primary input 117 volts AC, 50-1000 Hz to multi secondaries: 6.3v center tapped (3.15V) @ 2.5 amps, 12.8 volts center tapped (6.4V) @ 0.09 amps, and 580 volts center tapped (290V) @ 28 milliamps. Electrostatically shielded. Epoxy, open frame. NSN: 5950-00-647-7264. 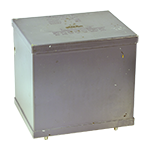 Dimensions: 3" x 3-1/4" x 2-3/4"
Thordarson transformer. 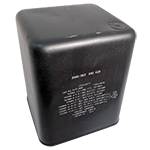 Primary input 115v AC @ 60 Hz to secondaries: 2.5/5 volts @ 3 amps, 6.3 volts @ 3 amps, 337.5/675 volts @ 30 milliamps. Rated 78 volt-amps. Sealed. Bottom terminals. New!! 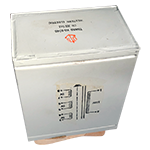 General Electric sealed high voltage transformer 1070 wv insulation @ 10k feet. 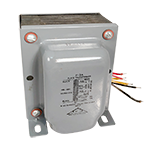 Primary input 115, 120, 126, or 132 volt AC to secondary outputs of 6.3 volt center tapped (3.15v) @ 2 amps, 6.3 volts @ 65 milliamps, and 710 volt center tapped (355v) @ 35 milliamps. Used, removed. Hewlett Packard transformer. 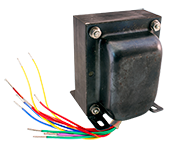 Primary input 115 or 230 volts AC to multiple secondary outputs of 5 volts @ 2 amps, 6.3 volts @ 1.5 amps, 6.3 volts @ 3.25 amps, and 380 or 760 volts @ 57 milliamps. Open frame with end bells. Wire out bottom. Dimensions: 4" x 3-1/4" x 3-3/4". New in the box. NSN: 5950-00-923-8376. Raytheon plate & filament transformer. 115 volt AC primary to 2.5 volts at 3 amps, and 770 volt at 2.5 milliamp secondaries. 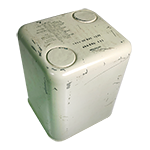 Dimensions: 3" x 3-1/2" x 4-3/4"H. Hermetically sealed. 3,500v test. Filament Transformer 103, 115, or 126 volt AC primary input to multiple secondary outputs of 5v at 2 amps, 6.3 volts at 1.5 amps, 6.3 volts at 5 amps, 6.3 volts at 10 amps, and 860 volt center tapped (430 volt) at 230 milliamps. Hermetically sealed. 1/4" stud bolts at bottom corners. New, old stock. All have some dents & scratches. Chicago Standard power transformer. 115V AC primary to multiple secondaries of 6.3v AC @ 3a, 6.3v AC @ 3a, 5.0v AC @ 3a, 6.3v AC @ .6a, 6.3v AC @ 7.5a. Filaments included: 5v @ 3 amps, 6.3v C.T. @ 5 amps, 6.3v @ 2.5 amps & 1 amp. Plate & Filament Transformer. Turret terminals. Hermetically sealed. 2-5/8" x 3-1/4", 10-20 stud mounting centers. Plate & Filament Transformer. Turret terminals. Hermetically sealed. 2-5/8" x 3-1/4", 10-20 stud mounting centers. Small dents. Plate & Filament Transformer. Turret terminals, hermetically sealed. Electrostatic shield. 2-1/2" x 3-7/16", 1/4-20 mounting centers. 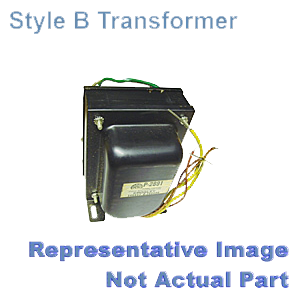 Hewlett Packard Replacement Plate & Filament Transformer. Primary: 115/230v. Secondaries: 131v @ 370mA, 128v @ 700mA, 30v @ 1.9a, 6.3v @ 0.6a, 6.5v @ 3.1a, 6.6v @ 4.8a, 6.5v @ 4.2a, 6.6v @ 4.8a. Hermetically sealed. 3" x 3-3/16" mounting centers. 1/4-20 corner studs. Turret terminals. Circa 1978. 5 Winding Transformer. Primary: 115v AC, 230v AC Brown-Brown/White, Black-White/Black. Secondaries: 26v CT @ 1 amp Yellow-Yellow-Red/Yellow, 6.3v @ 2 amp Blue-Blue, 40v @ 0.5 amp Violet-Violet, 170v @ 0.2 amp Green-Green, 180v @ 0.1 amp Red-Red. 130 watts. 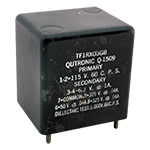 Qutronic transformer. Primary: 115v @ 60 Hz. Secondary: 6.3v @ 1 amp, 325v @ 40mA, tap at 5.0v @ 40mA. 1000v test. Hermetically sealed. Hook terminals on bottom. Some rust on case. 2-3/8" x 2-3/4" x 2-11/16". 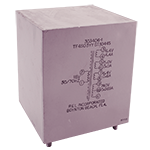 Dimensions: 4-3/4" x 3-5/8" x 7-1/2"
Raytheon transformer. Primary: 115v AC @ 60 Hz. Secondaries: 4580v @ 2mA, 2.5v @ 3 amp. 4-3/4" x 3-5/8" x 7-1/2". 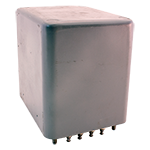 Western Electric transformer. Primary: 115v @ 60 Hz. Secondaries: 6.3v @ 1.2a, 180v @ 20mA, 5.1v c.t. @ 7a, 30v @ 20mA. 3-1/2" x 4-1/2" x 5-1/4". Plate and filament transformer. Primary: 115v AC @ 60 Hz. Secondaries: 6.4v AC @ 6a, 12.6v @ 1.2a, 260v @ 120mA. Hermetically sealed. Circa 1960. 3-1/4" x 3-7/8" x 5-1/8"H. New, but minor scratches and dents. Central Transformer plate & filament transformer. Primary: 115v @ 60 Hz. Secondaries: 400v DC @ 0.12a, 225v AC @ 25mA, 6.3v @ 6a, 6.3v @ 1.5a, 6.3v @ 3a, 6.3v @ 1a. Hermetically sealed. 4-1/4" x 5" x 5-1/2"H. 3-1/4" x 4-1/16" mounting centers on 1/4-20 studs. Hewlett Packard plate & filament transformer. Primary: 1,3: 115v @ 50/60 Hz. 2,4: 115v. Secondaries: 5,6: 6.3v @ 2 amp. 7,8: 125v @ 100mA. Hermetically sealed. 2-13/16" x 2-3/8" x 2-1/2". Freed transformer. Hermetically sealed. 1/4" - 20 stud mounting centers, 3-3/4" x 4-1/4". 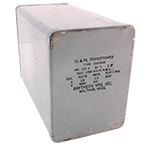 Raytheon Plate/Filament Transformer. Beautiful hermetically sealed & electrostatically shield. Turret terminals. 10-32 studs @ 4-3/4" x 3-7/8" mounting centers. 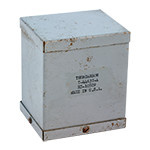 Manson Laboratories filament transformer. Hermetically sealed, electrostatically shielded. 6.1v, 5.6 amp filament winding. 75v DC @ 30 ma in a HW bridge / capacitor input configuration. New! Thordarson plate & filament transformer. Mounting centers: 2-1/8" x 2-1/8". New, old stock. Shelf worn. Triad plate & filament transformer. 600/300vct @ 300mADC. Filament: 5v @ 4 amps. Chicago Transformer plate & filament power transformer. Primary: 117v @ 50/60 Hz. Secondaries: 6.3vct @ 1.0a, 6.3vct @ 5.0a, 5.0v @ 6.0a, 1100vct @ 300mA or 740vct @ 300mA or 150vct @ 300mA or 425vdc @ 300mA. New in the box! Only one available. Radionics plate & filament transformer. Electrostatically shielded. Hermetically sealed.